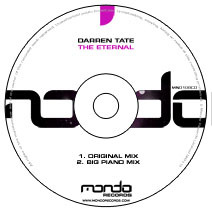 Having delighted fans and given them a taste of what's to come in the form of his Horizons 03 Winter Sampler, Darren Tate returns with his latest single entitled 'The Eternal'. Any dance music aficionado will know that only the finest quality comes out of the Tate studio, and as a producer he is responsible for countless iconic club hits and epic remixes that have smashed dance floors around the globe. With "The Eternal" he once again lives up to that extraordinary high standard, delivering the goods in the form of a beautifully crafted uplifting progressive trancer with not one but two phenomenal peak time club mixes. On the flip Darren provides an immense house take with an absolutely epic piano drop perfect for some serious big room moments. Expect nothing short of mayhem in the clubs and at festivals this summer when this monster is dropped!